Charley Hoffman has five top-10 finishes this season and sits at No. 33 in the FedEx Cup points list. 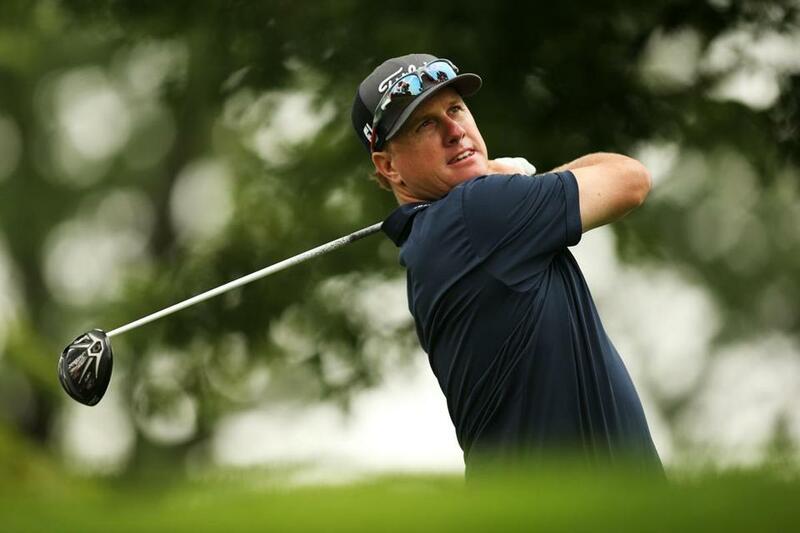 NORTON — Even though Charley Hoffman has missed the cut in two of his last four starts on the PGA Tour — and not been close to contention in the other two – he’s expecting to have a big week at the Deutsche Bank Championship. Hoffman won the DBC in 2010, closing with a 62 to turn what had been a four-stroke deficit into a five-shot victory. Even though it’s been four years, returning to TPC Boston provides Hoffman with a big shot of confidence. “Yes, because you’ve got great visuals. I remember having good shots coming down the stretch, and that definitely helps you. There’s golf courses that fit [others’] eyes, and this golf course fits my eye,” Hoffman said. It’s been a while since Hoffman has been in the mix. He tied for third at the Quicken Loans National, which is his best finish of the season, and one of five top-10 finishes. And despite not having a great record in the DBC other than his win (in seven additional starts his best finish is a tie for 26th), Hoffman is confident that the success he had here then can lead to another good week now. At No. 33 in the FedEx Cup points race, Hoffman has another reason to play well. He’d like to jump into the top 30 and qualify for the season-ending Tour Championship, because those players automatically gain spots into all four majors for the following season, and Hoffman is not eligible for any as of the moment. One week can change everything, as many tour players and observers know. Without a good week at the Barclays, Stuart Appleby would have been sent home, his playoffs over, his schedule for next season likely filled with gaps and unwanted off weeks. Instead, Appleby almost won the Barclays, finishing in a three-way tie for second, two shots behind Hunter Mahan. Appleby earned enough points where he’s not even on the bubble this week to move on to the next playoff event. At No. 19, Appleby is guaranteed a spot in the BMW Championship, which is reserved for only the top 70. But now, thanks to one great week, he has his sights set on something else, even beyond the BMW. “It’s given me much more of a dream to get back to Atlanta to play the Tour Championship, which [means] a lot more golf events. That’s been a plan of mine, to get back into the cool crowd,” Appleby said. It’s been four years since he last won on the PGA Tour, when he closed with a 59 to win the Greenbrier Classic. That final round earned Appleby a place in golf history, but the seasons since have been a struggle. He’s finished 129th, 162d, and 132d on the money list the past three years, so this season — he’s No. 64, with more than $1.4 million — has helped ease some of the doubts Appleby has acknowledged having. Of the 94 players expected to start on Friday — a record low for this event, by the way — 17 have never played in the DBC, so they’ve been busy getting their first looks at TPC Boston. The other first-timers: Steven Bowditch, Gonzalo Fernandez-Castano, Chesson Hadley, Justin Hicks, Morgan Hoffmann, Billy Hurley, Ryo Ishikawa, Russell Knox, Scott Langley, Danny Lee, Ben Martin, Hideki Matsuyama, Michael Putnam, Shawn Stefani, Robert Streb, and Andrew Svoboda. Only two players have ever won the DBC on their first try: Adam Scott, who triumphed in the tournament’s 2003 debut; and Phil Mickelson, the 2007 champion. Mickelson, who left the Barclays on Saturday and flew home to California after missing the secondary cut, apparently has decided to play in the DBC. Frustrated with his game — “I’m barely keeping my sanity,” he said — Mickelson was not sure if he would fly back across the country and play at TPC Boston. But he’s in the pro-am field on Thursday, with a noon tee time off No. 1, and is grouped with Hicks and Ishikawa for the first two rounds . . . If you’d like to get a look at Rory McIlroy on Thursday, plan on getting here early. The world’s top-ranked player and winner of the 2012 DBC is scheduled to start his pro-am round off No. 10 at 6:50 a.m. . . . Keegan Bradley hosted a clinic on Monday in his native Vermont, at the Woodstock Inn & Resort. Proceeds from the event, which was held for the third straight year, will go toward pediatric cancer research and opiate addiction treatment programs . . . Players and caddies at TPC Boston on Wednesday were saddened to hear of the death of Angela Bennett, the wife of Lance Bennett, who caddies for Matt Kuchar. Angela Bennett died suddenly early Wednesday. Kuchar will play in the tournament . . . He wouldn’t be eligible to play even if he wasn’t recovering from a back injury, but that was Tiger Woods holding court at the DBC pro-am welcome party Wednesday night. Woods’s foundation has been the tournament’s primary charitable beneficiary, and Woods won the event in 2006. But he’ll miss the DBC for the third time since then.